Bring on the snacks, arranged on your own mancave-style "Snarling Bulldog" cutting board! 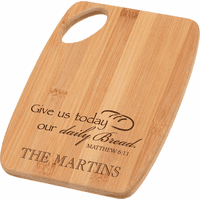 The board is solid natural bamboo, with a paddle shape that is easy to carry, and has a hole in the handle to hang it on the wall. 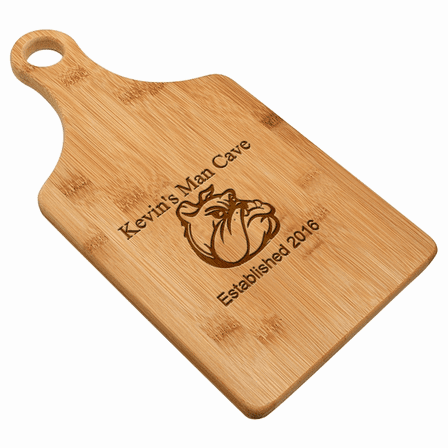 It features our laser-engraved "Snarling Bulldog" design, and will be personalized with a name and "date of establishment", for no extra charge. 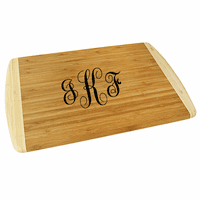 The bamboo cutting board comes packaged in a gift box, ready for any special occasion. 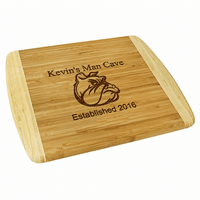 Dimensions: 13 1/2" x 7"